Whether your market is quick-print, copy shop, in-plant, offset, or on-demand, Triumph makes the ideal cutter for your needs. Backstop Length : 15 5/16"
Minimum Cut : 1 3/8"
Whether your market is quick-print, copy shop, in-plant, offset, or on-demand, Triumph makes the ideal cutter for your needs. Manufactured in Germany by MBM's parent company, IDEAL Krug & Priester, Triumph paper cutters set the world standards for safety and precision. Every Triumph model features either transparent safety guards or safety light beams and all electric models require true two-hand operation. All Triumph hydraulic models utilize precise clamping pressure for mark-free cutting of specialty stocks. The MBM 4315 Semi-Automatic Electric Paper Cutter features an electric blade drive, a patented, lever-activated, fast-action clamp, a spindle-guided back gauge with calibrated crank, and an optical cutting line. The Triumph 4315 Electric Cutter includes a side guide with measuring scale, solid steel blade carrier, optional stand (shown) or cabinet, UL and C UL approved. 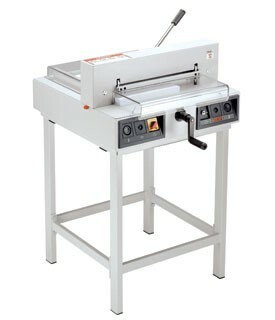 The MBM Triumph 4315 Paper Cutter also includes some great safety features including external blade depth adjustment , two-hand operation, transparent safety guards on front and rear tables, automatic blade return from any position, disc brake for instant blade stop, and a safety lock with key and main switch. SCS (Safety Cutting System) package: transparent front and rear safety guards (electronically controlled front guard locks automatically while cutting); main switch and safety lock with key; electronically controlled, true two-hand operation; 24 volt control (low voltage); patented IDEAL safety drive; automatic blade return from any position; disc brake for instant blade stop; blade can be changed from front of machine without removing covers; blade changing device covers cutting edge of blade; external blade depth adjustment and cutting stick replacement. Adjustable, hardened steel blade guides. Patented, lever-activated, fast-action clamp. Solid steel blade carrier. Spindle-guided back gauge with calibrated crank. All-metal construction. Table length in front of blade 9". Motor 3/5 hp.